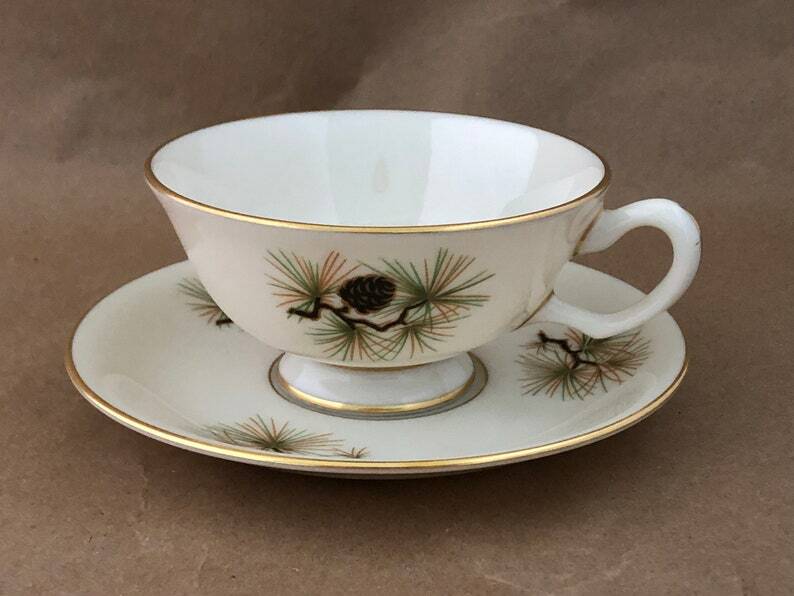 This cup and saucer is a fine Lenox china pair in the Pine pattern featuring simple images of pine needles and pine cones. The design is accented with narrow bands/stripes of gold trim in 3 places on the cup and 2 places on the saucer. The Pine pattern was produced by Lenox during the mid century modern years between 1951 and 1977 and is a beautifully versatile pattern whose natural neutral colors, and strong references to nature with its pine cones and pine foliage, works remarkably gorgeously anytime, but particularly during the fall season which includes Thanksgiving, and and through the winter including Christmas and New Years. 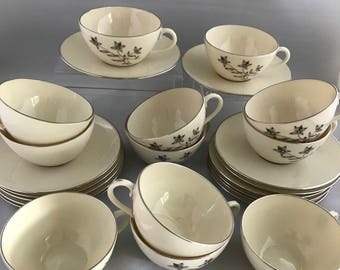 The cup measures 4" diameter x 2 1/2"h. The saucer is 5 1/2"w. And despite this pair's 42 - 68 year age status the pieces are in beautiful undamaged and unworn condition -- probably very lightly used only for special occasions, as were so many of the fine china dishes of this era.